Just realized, hes gone, what a relief! All the nonsense and injuries that plagued the Mets last season allowed me to forget about the horrid pitcher that plagued our team alone in 2008; Aaron Heilman. Recently, in seeing his name mentioned in a trade to the Diamondbacks, I began to think of how much hell this man put the Mets through on and off the field. It all began with his outrageous desire to be a starting pitcher. Obviously, the Mets didn’t think he was suited for the role, quite frankly, I don’t think hes suited for any pitching role. Aside the malarchy Heilman plagued the Mets clubhouse and coaching staff with, he was, as a fan, disgraceful to watch on a regular basis. I remember, time after time, seeing Heilman come in, and waiting for him to blow the game. It was a sickening feeling. As a sports fan, you should not have to worry when your manager brings a pitcher in. 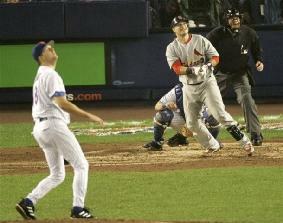 I almost threw up when I witnessed him give up the homerun to Molina, and I was ready to dump him there. The Mets kept him on the roster, and he blew something like 9 games in 2008. It is even more annoying to sit here and think that we missed the playoffs by just ONE of those 9 games, he blew. So I end my post with this; the Mets have made some pretty good moves, and some pretty bad moves in the past few years. Some may be argued to be positive and negative, but I’m sure there is one move that Met fans will all agree with eachother on. That is, the dumping of Aaron “thanks for blowing our 2006 season” Heilman to the Mariners for another useless Met setup man J.J. Putz. Seattle then sent him to the Cubs in time for him to plague a different National League team with his problems.